I reproduce here the latest in a developing series of blog posts which are appearing on Beauty of Catholicism website by Martinho Correia, about the work of Michelangelo and Caravaggio. He calls it The Two Michelangelos (Caravaggio’s first name was Michelangelo). In it, he shows how the second, the trailblazer in Rome who began the baroque tradition around 1600, drew influences from the first, the great painter of the Sistine Chapel who was one of the forming influences on the High Renaissance. You can find The Two Michelangelos, Part 1 here. This is the “Martyrdom of St. Matthew” from the Contarelli Chapel in San Luigi Francesi in Rome. 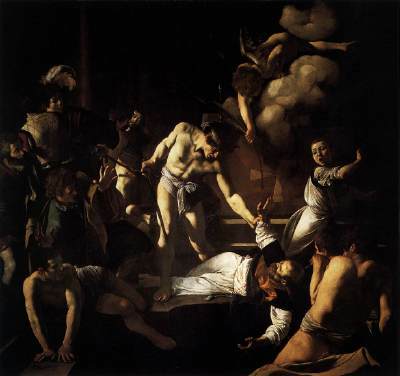 Caravaggio’s version of the martyrdom was inspired by the Golden Legend, according to which St Matthew was murdered while celebrating mass in the Ethiopian city of Nadaber. He had refused to marry the King Hirtacus to Ephigenia, a consecrated virgin; upset at this, the king sent an assassin to kill the Saint. The white vestments of Matthew set against the dark background bring our attention to the center of the painting, as the assassin stands over the saint, about to kill him. At left we see a group of young men (including Carvaggio’s self portrait at the back) dressed in contemporary 17th century clothing, as in the “Calling of St Matthew” (on the opposite wall). This group could be the faithful who, upon witnessing the murder, ran to light fire to the king’s palace. On the right is the altar boy running away from the scene, while just behind him is the altar. The bottom group is somewhat confusing as it seems the figures are distorted and/or limbless. Could this refer to the cripples that St. Matthew was known for healing? The strange space they are in may be a reference to the Pool of Bethsaida, a healing pool in Jerusalem mentioned in St. John’s Gospel. It is the grouping of St Matthew and the assassin that is most interesting. Once again, Caravaggio references Michelangelo’s Creation of Adam, using the body of Adam in the place of the assassin. Below I have photoshopped Adam next to the assassin to demonstrate the similarity. The assassin is Adam upright, on his feet, Adam who has become sinner and been exiled from Paradise. The assassin/Adam grabs the hand of Matthew, trying to block contact with the palm of martyrdom being offered to him by the angel above. Adam here is an image of arrogance, in contrast to the redemptive power offered to Matthew. It is sin that prevents us from receiving the grace of God. In this grouping, Caravaggio represents the complex rapport between human and divine. With “The Calling of St. Matthew,” the hand of Adam became the hand of Christ that calls Matthew. In “The Martyrdom of St Matthew,” the body of Adam just created becomes the arrogant body of Matthew’s assassin, while the angel above Matthew flies down from God the Divine Creator.